I was visiting my family in Massachusetts the week before summer vacation ended, and I just had to bake them something delightful that could be enjoyed in the sweltering heat that captured our town during that time. I didn't have a whole lot of ingredients on hand, so I turned to something I've done before in cream puff form… the eclair. I adore eclairs! They are so wonderful to bite into when fresh… the delicate crunch of a pastry shell filled with cold and creamy custard, and sweetened with just enough chocolate. Perfection. Luckily for me, elcairs use the same dough as cream puffs, which needs only basic ingredients found in every kitchen. The same goes for the pastry cream filling as well. 1. Preheat oven to 400 degrees F. Place rack in center of oven. Line baking sheet with parchment paper (I used wax paper). 2. Stir together flour, sugar, and salt in a small bowl. Set aside. 3. Combine butter and water for the eclair shells into a heavy saucepan over medium heat, bring to a boil. Remove pan from heat and immediately stir in the flour mixture all at once, stirring until a ball of dough forms in the pot. This should happen pretty quickly. 4. Let the dough cool slightly (you can stir it up to release the heat), then add the eggs one at a time, stirring well after each addition until the egg is well-blended to form a smooth batter. 5. Spoon the dough into a ziplock bag and snip off the tip to about 1 inch in diameter. Pipe the dough into 3-4 inch long stripes onto the lined baking sheet, spacing the eclairs 2 inches apart. 6. Gently brush the surface of the piped eclairs with the beaten egg white. 7. Bake for 15 minutes, then turn down oven temperature to 350 degrees F to continue baking for another 30 minutes. The shells should be a nice golden-brown color. 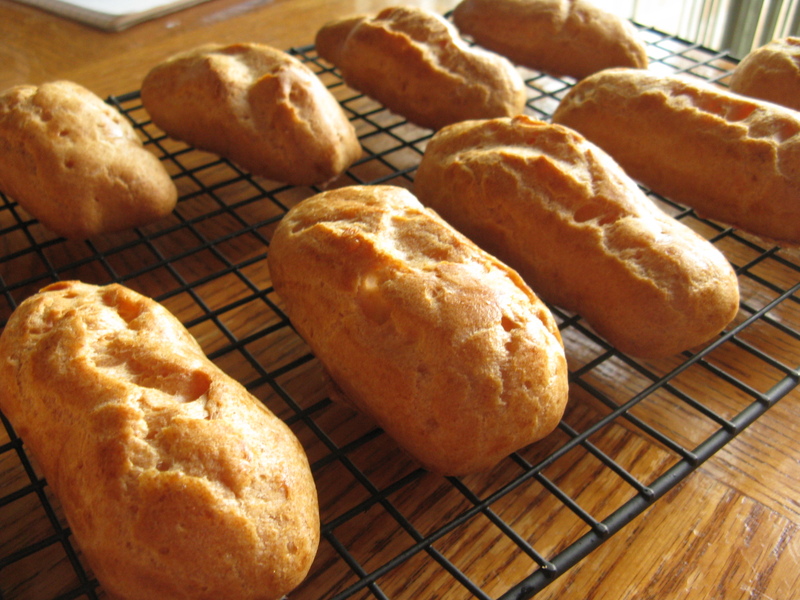 Turn off the oven and leave door ajar, with the eclairs sitting inside for another 10-15 minutes to let them dry fully. Remove from the oven to cool on a wire rack, peeling eclairs off carefully (this is where all of my eclair bottoms broke off). They will have a wonderful cracked appearance on top. 1. In a medium-sized stainless steel bowl, mix together sugar and egg yolks. 2. Combine flour and cornstarch in a separate bowl, then add to egg mixture and stir until a smooth paste forms. Add vanilla. 3. In a saucepan (preferrably stainless steel, I find non-stick pans to be awful for making custards), heat milk on medium until just boiling. Remove from heat and slowly whisk into egg mixture, careful not to let egg curdle. 4. When fully incorporated, place egg and milk mixture back onto the stove to cook on medium heat, whisking constantly until it starts to boil. Keep stirring and it should thicken up very quickly. When it has reached a desired thickness (I prefer mine to be pretty thick), remove from heat immediately and whisk in the water. You can add more water if your pastry cream is too thick. 5. Chill pastry cream in fridge for several hours, covered with a layer of plastic wrap touching the surface of the pastry cream to prevent a skin from forming. Normally you would slice the eclairs open by cutting horitzonally on each one to cut off the tops. Since mine had holes in the bottom I just pried the holes open until they were the same size as the eclair and piped in the pastry cream (using the same ziplock bag trick that I used for piping the elcair dough). Fill each eclair with enough pastry cream to fill out the shell, but not so much that it bursts. If using cut open shells, replace the tops once the filling has been added. Finally, melt the chocolate chips in the microwave, and stir in the vegetable oil to thin out the consistency enough to drizzle. I just eyeballed this, so you can adjust the chocolate icing how you like. Take a fork and dip it into the chocolate to drizzle it over the eclairs. Serve immediately for the best taste and texture. If not serving right away, I suggest you not fill the shells so that they don't get soggy. Fill them just before serving and you will wow your guests with how fresh they taste, nothing like the pre-filled ones you buy at stores! This entry was posted on Sunday, August 23rd, 2009 at 7:08 am	and posted in baking, desserts, French, recipes, Uncategorized. You can follow any responses to this entry through the RSS 2.0 feed. Anyways, I just wanted to say that parchment paper is unbelievable – it is the ultimate in non-stick for baking. Maybe try the eclairs again with parchment paper and you will get them perfect (not that they will taste any better)! Thanks Helena! Now I’ll know to splurge on parchment paper the next time I try to bake these, I never thought paper of all things would be the best haha. Good luck on your MCATs! It doesn’t feel like that long ago that I took them… but boy it’s been 3 years already! And I’m sure you will do great! This recipe is awesome. I doubled the recipe and made half eclairs, half creme puffs. I used parchment paper :) and they came off the sheet super easily. I didn’t have chocolate chips so I whipped together some cocoa powder, milk, and powdered sugar to make the chocolate drizzle. 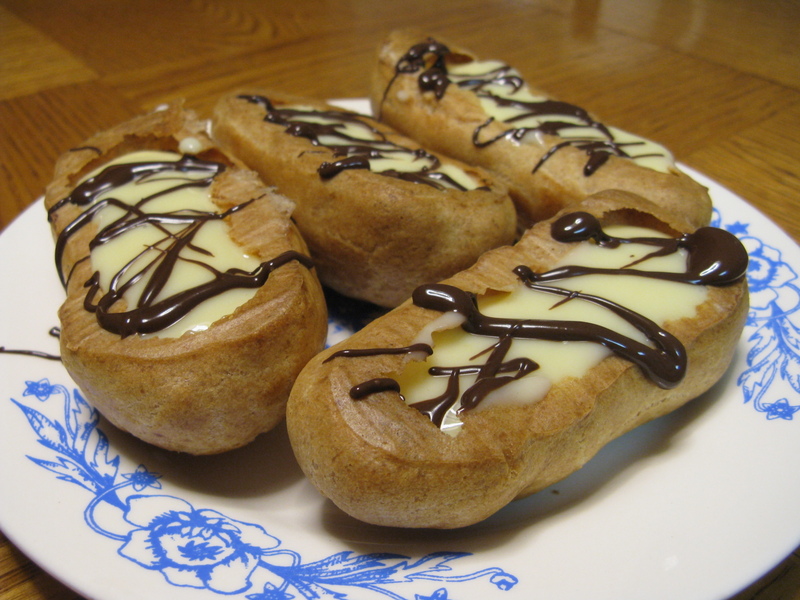 The eclairs turned out to be light, fluffy, and incredibly delicious– thanks so much for your post!